It’s one of my favourite times of the year – picking season! Barrie is blessed to be surrounded with you-pick farms where families can gather fruit and vegetables in a natural setting. But a few years ago, I dreamt that we could pick fruit without even having to leave the city. FruitShare Barrie is the realization of that dream, and we are gearing up for our third season of rescuing and sharing the fruits nature provides right in our own backyards. In the previous two years, we picked the majority of our fruit in September and October: apples and pears of many varieties, some grapes, and a few plums. But there is a wider variety of tasty food growing around us, and this year we hope to expand our operations to include a number of local berry crops ripening in the coming weeks, to start gathering and sharing that much sooner. I want to be buried in berries! Two years ago we were lucky enough to catch a bumper crop of sour cherries, and we are sure there are more cherries out there. If you know of any, please tell us! 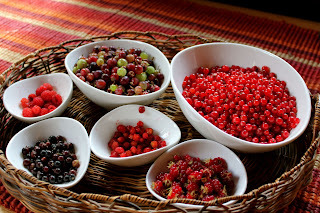 We are also on the lookout for various berries which thrive in our local climate. As a special treat, this year we are going to make a go at harvesting a native crop: serviceberries, also known as Saskatoon berries, or by many other names. While the bush we planted in my front yard seems not to produce much, luckily Barrie’s horticulturalists have been planting serviceberry bushes in parks and public greenspaces around the city as an ornamental shrub, so we’re hoping that will provide our first bumper crop. But if you have these berries in your yard, or mulberries or elderberries that are producing, we’d love to come and pick them for you and share them between you, us, and Barrie’s hungry. One of the key elements of our program is to help those facing challenges in obtaining healthy, affordable food. So when FruitShare rescues fruit, we leave up to a third with the owner, take up to a third for the volunteer pickers, and then donate what’s left (usually more than half) to the Barrie Food Bank or other social agencies for free distribution. In each of the past two years, over a ton of fruit was shared this way. This distribution structure not only puts more fresh healthy food into the system, it also allows people to harvest directly to their own tables. And new this year, we are hoping to better localize FruitShare Barrie by finding local business sponsors. The newspapers, radio, and TV all love to tell FruitShare’s success stories, and we’d love to tell them how our operations are funded by the generous support of YOUR-NAME-HERE! So as the 2015 FruitSharing begins, step up and take your part! If you have a fruit tree or berry bush we can pick, visit FruitShareBarrie.ca to register. If you’d like to come out and pick fruit, you can also enlist as a volunteer there. (We have other organizational volunteer opportunities, too.) If you know someone with a fruit tree, have them contact us, or you can email FruitShare.Barrie@gmail.com or call 705-715-2255 and we’ll follow up. And if you are a supportive local business willing to sponsor a very worthy cause, please get in touch with us! 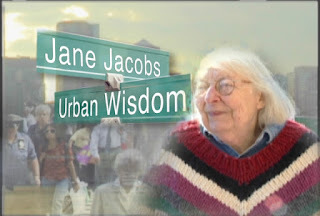 Published as my Root Issues column in the Barrie Examiner as "Picking season looks good for FruitShare Barrie"
This Saturday, June 20, something new comes to Barrie: Jane’s Walk, a free, citizen-led walking tour inspired by urban activist and writer Jane Jacobs. Held periodically in different cities, Jane’s Walks let people tell stories about their communities, explore their cities, and connect with neighbours. Our walk begins at 1 PM at Barrie City Hall. The timing is ideal because just last week I received the latest issue of the American Journal of Economics and Sociology, themed Public Intellectuals: Jane Jacobs and Henry George. It compares and contrasts the views, through their writings, of two people active a century apart but with a surprisingly complementary outlook on the problems of poverty and urban decay. 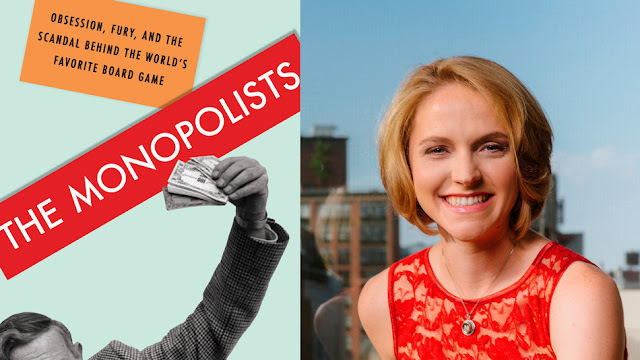 In his world-famous 1879 book Progress and Poverty, Henry George observed that the greatest levels of wealth were found and indeed produced in cities, yet that was also where one found the deepest poverty, hence what we now call the widest wealth gap. Applying his understanding of classical economics, he revealed the problem’s root was how land was owned, rented, and taxed; basically, those who owned land could profit from the efforts of those who didn’t without making their own contribution. He noted that land values arose from their surroundings, whether public infrastructure or private economic activity; these values were not created by the landowners themselves. His solution, land value taxation, was for this commonly-created value to be recaptured, allowing for the reduction or elimination of all other stifling taxes, including wage tax, sales tax, or property tax on the value of buildings. Importantly, he noted that so long as land values were not fully captured, there would always be speculators holding prime urban land idle, because they could profit more by selling at inflated values than by putting the land to productive use. This causes artificial land scarcities, driving up rents and forcing new buildings to be taller or to sprawl into green fields, eventually to the benefit of the speculators themselves. Jacobs, a century later, focused on buildings, neighbourhoods, and the organic activity of city residents. She opposed central planning that destroyed old, dilapidated neighbourhoods to replace them with uniform new “projects” intended to help the poor but ultimately trapping them. She promoted higher density, short blocks, and mixed uses as a way to create thriving local economies, and famously declared “new ideas need old buildings,” because they offered low-cost spaces for new enterprise, or new residential forms, to start up. Both George and Jacobs were anti-Malthusians; both believed the density of cities did not have to mean unhealthy crowding, but rather that more people in close association could more efficiently share resources and ideas allowing highly productive, richer lives. Where the kind of neighbourhood redevelopment Jacobs envisioned could sometimes lead to gentrification, pricing lower-income residents out of their own improving neighbourhoods, the application of George’s land value tax would keep land prices stable and ensure the public shared in any rising land values, and promote general improvement across the wider city instead of only in the areas that were currently “hot”. Published as my Root Issues column in the Barrie Examiner as "Jane's Walk a good way to connect with community"
If you get your news from TV, especially Fox, or from certain major newspaper chains, then you might have the impression that climate scientists disagree with each other on what’s causing global warming or if it’s even happening, or perhaps picked up the idea that global warming has “stopped” or “paused”, or that major predictions of warming have somehow failed. I don't believe in rising ocean levels, either. Well, all of that is really a pile of bunk, promulgated by right-wing media outlets and think-tanks and assisted by the mass media’s tendency to seek “balance” in news by quoting from each “side”. But as is demonstrated in the new book “Climatology vs.Pseudoscience: Exposing the Failed Predictions of Global Warming Skeptics”, this search for “balance” has seriously skewed the public’s perception. The reality is that an overwhelming 97% majority of published climate studies demonstrate human activity is warming the planet, in a dangerous direction. What’s more, the 3% of conflicting studies are often published in questionable ways, such as through journals not specializing in climate science or deliberate manipulations of the peer-review process. The “skeptical” scientists who have written many of these studies make basic flaws or omissions in process, or state conclusions not supported by data unless one cherry-picks dates or overlooks important counter-indications. Written by my friend and fellow climate presenter Dana Nuccitelli, contributor to The Guardian and a scientist himself, “Climatology vs. Psuedoscience” does something that has never been done before: it takes specific climate change projections made over the years by pioneering and mainstream climate scientists, and those made by “skeptics”, comparing them with subsequent temperature measurements to see which has proven a better predictor of what came to pass. Perhaps not surprisingly, the projections made by most climate models, including those used by the International Panel on Climate Change (IPCC), have turned out to be extremely accurate, while predictions of cooling or other non-standard temperature patterns made by “skeptics” were clearly way off-base. What’s really sad about this, though, is that much of the right-wing media actually claims the opposite, by promulgating views of “skeptics” (really, global warming deniers) not backed by any good science, and repeatedly going to self-billed “climate experts” who are either not actually trained or publishing in climate science, or whose predictions or studies have been consistently disproven. For some reason, the media keeps trotting out the same notorious “expert skeptics” whose past pronouncements have all been wrong. These deniers really have no credibility, and are chosen for no more reason than that their contrarian views make what should be a cut-and-dried story into some kind of “controversy”. This perverts the real story about how the climate change consensus continues to get stronger and clearer, and how the time to act on it is now. Well, the bets were placed, the results are in, and as Nuccitelli clearly demonstrates in his book, global warming continues apace as the IPCC has warned while the predictions of skeptics keep falling further to the wayside. So if you still think we are in some kind of “pause”, or that climate change is merely a hoax, you owe it to yourself to put your skepticism to the test by reading this book and learning just whose science has proven true. Because while everyone is entitled to their own opinions, the science of human-caused global warming is an undeniable fact. Published as my Root Issues column in the Barrie Examiner as "New book tests opinions about global warming"